Anwyl Group began life in 1930 in Rhyl, North Wales. The original company was a joinery and woodworking contractor, but with well over eight decades of success behind us, we now operate three distinct divisions: Anwyl Homes, Anwyl Construction and Anwyl Land. In the years following 1930 we began to deliver larger construction projects and, in 1940, expanded into house building, a successful venture which continues to form a large part of today’s Anwyl Group. By the end of the 1980s we decided to expand our activities much further afield and, in 1991, we invested heavily in our specialist woodworking workshop. This ensures our thoughtful approach is even more evident, as we can create bespoke staircases, window frames, door frames and more. The facility enhances our efficiency and flexibility as it gives us more control over specific design elements within each building, and means that should designs need to change for whatever reason, we are in a position to respond swiftly without impact overall timescales. 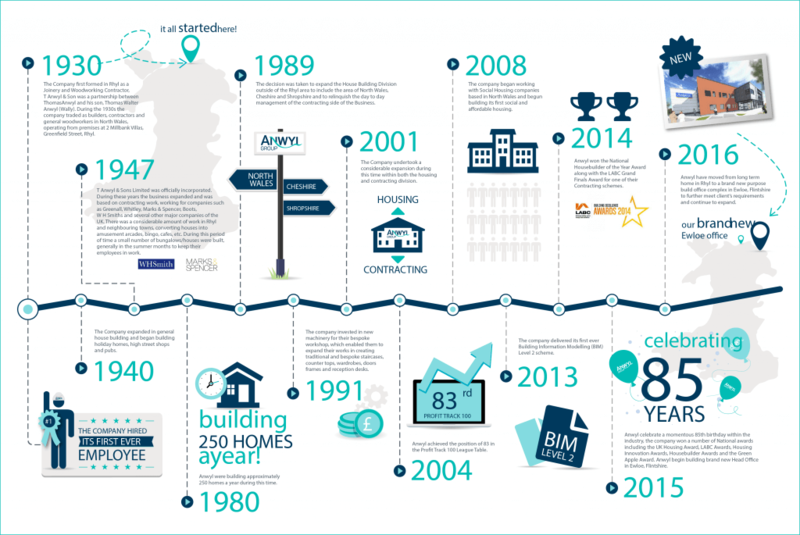 By the time we reached our 85th birthday in 2015, there was so much for us to be proud of. We were honoured to win many prestigious national awards, including success at the UK Housing Awards, LABC Awards, Housing Innovation Awards and three-time winner of the RoSPA Gold award. As well as continuing to create high quality, award-winning developments, we also decided that we had outgrown our Rhyl base and it was time for us to move into a new, purpose-built head office. In 2016, we took up residence in Ewloe, Flintshire, and it’s from these new headquarters that we look forward to many more decades of thoughtful building in the future.